Bad bikes, and I don't mean bad good. Pick the Top Ten Worst Dirt Bikes of All Time? Wow! Where does one start? Surely not with the current crop of dirt bikes. You would be hard-pressed to find a genuine lemon among the new iron-but how far back do you go? After all, before the dirt bike boom (circa 1970), there were a lot of clunkers being foisted off on an unsuspecting public. So, after considerable thinking (about ten minutes) I decided to limit the selection to dirt bikes that I actually tested. This meant that our starting year was 1970. And this makes a great deal of sense, in that the dirt bike boom started in the late '60s. WHAT MAKES A BAD BIKE? I feel that a truly bad bike should have few-if any-redeeming values. There have been great-handling bikes with fragile engines and transmissions. There have been powerful machines with less than stellar handling-and then machines with a bit of both. The real losers, though, are those with more faults than virtues. Machines that will spit you off for no apparent reason. Or bikes that are so dull and listless that you'd rather be riding in a Buick station wagon with the windows rolled up. Then you have dirt bikes that have all the reliability of a candle in a windstorm. Throughout the years, I have fallen in love with flawed-but great-machines. Consider the Maicos of the early and mid-'70s. They required a great deal of prep, set- up and TLC, but when they were dialed in nothing else could run with them. Riders put up with a wimpy primary chain drive, reluctant clutches and bogus ignitions. Think about the CZs of that same period. Heavy. Crude. Poor shocks. But almost unbreakable. How about the various Spanish bikes? All built from inferior materials, but they were speedy and handled like magic. Those who took the time to learn how to live with them were rewarded with stunning handling and correct powerbands. Novice riders who bought the Bultacos, Ossas and Montesas of that period ended up pulling out their hair by the handful, promptly sold the strange beasts and then bought reliable Japanese mounts. Then we had the off-brands: Puch, DKW, AJS, KTM, Penton, Sachs, Greeves, American Eagle, Rickman, Rokon, Harley-Davidson, Steens, Bridgestone, Bronco Apache, Chaparral, Carabela, Cooper, Monark, Zundapp, Yankee and a few others that will probably come to mind later on. ODDITIES THAT BOGGLE THE MIND! The Bridgestone Hurricane Scramblers of the late '60s and early '70s had a rotary shift pattern that was bizarre beyond belief! You would shift up through all six gears, then when you hit the shifter one more time it would go back to low gear. Imagine the surprise when the rider was in top gear, all tucked in and howling down a fire road, and snicked the lever one more time, only to be greeted with low gear and 11 million instant rpm! Rokon came out with the first automatic trans (actually, a torque converter) with the power delivered via a rubber belt. This beast also had to be started like a lawn mower; you had to pull a stupid rope. When it got hard to start, you would be sucking wind in a hurry. When that torque converter belt got wet, it would slip and smoke like a worm on a barbecue. Greeves found out that the kickstarter would not clear the footpeg when starting, so you had to fold up the peg by hand and hook it onto a restraining ring. Nice touch. Numerous Euro bikes came with paper filters. When the engine backfired, the premix would saturate the paper and it would pass about the same amount of air as a can of peaches. If you rode through water, your ride was over. Gag, puke, cough, wheeze. The IRZ carburetor. It came stock on Ossas and was virtually untunable. This wretched carb had two needles and two completely separate fuel circuits. Taking it apart required the patience of Job and the hands of a brain surgeon. Putting it back together was even worse. Jets were expensive and nearly impossible to find. Some fun. Hatta forks. They came stock on various Kawasaki "enduro" bikes. The ads billed them as "101 ways adjustable, unfortunately, none of them were correct. Mr Hatta designed landing gear for bombers during World War II and was quoted as saying, "It's easy to make a suspension for a bomber. It only has to stroke once. A motor cycle is confusing. It has to stroke numerous times." When all things are considered, a list of duds is crystal clear. The following is a compilation of dirt bikes that meet all the requirements of what is truly bad. It's based on frightening traits, unreliability, poor handling, mechanical woes, dumb engineering, freaky response and un-fun riding feel. 10. 1974 HUSKY 450 DESERT MASTER. The head engineer, Reuben Helmen, designed this lost cause at the urging of his cousin- who he promptly disowned. This bike was 35 pounds heavier than previous Huskies, worlds slower, had an awkwardly spaced gearbox and a stupid power curve. It also had ancient Girling shocks that lived to puke seals and forks that had more metal shavings than fork oil in each leg. The exhaust burned your leg, brakes were gruesome and shifting was ugly. It also seeped mung and drool out of every gasket surface. Handling was best described as spooky. The engine pinged like it was running on kerosene and items fell off the bike like they were held on with Scotch tape. 9. 1981 HONDA CR450. Actually, it was a 430. A 430 with a hopelessly spaced four- speed gearbox and a powerband like the tip on an X-Acto blade. It shook the steering head like someone removed the bearings, and tracked like a buffalo on steroids. The front number plate looked like a hangnail, and the suspension was a mass of confused Showa leftovers that didn't like each other. -This bike would get into a high-speed wobble at 38 mph, stalled easily and the odd spacing in the gear box always kept you over-revving the engine or bogging below the power curve. Oh sure, it had a lot of power, but the power delivery was freaky. It would either hit hard, or hesitate, but you were never sure which would happen. Geared for off-road use, low gear would take you out to 45 mph, while fourth gear might squeak up to 80. Topping off its list of bad habits was that it was hard to start when cold, harder to start if you dropped it and when it got hot, and it tended to foul plugs and ping. 8._ROKON 340. Brought out in the mid'70s, the Rokon was supposed to be the answer for those of us who hated to shift. All versions of the Rokon were very heavy, and loved to plow straight-on ahead, even if you sort of wanted to turn at the time. To start the big Sachs engine you had to tug at a rope-starter, which took a strong arm and an even stronger patience level. It came poorly jetted, and when it loaded up you would rip half the calluses off your hand before getting things spinning. We talked about the belt drive earlier, and the less said about this the better. The thing was fast and had disc brakes to slow it down. Sadly, they worked intermittently, and the master cylinder often boiled over, leaving you with a lever that came back to the grip and a corner that rushed up to meet you. Gearing down was impossible with the torque converter, which meant you free- wheeled into turns and down hills. Spooky. 7._YAMAHA SC-500 SCRAMBLER. Another four-speed brute, this 1973-'74 two-stroke single ran hot, detonated fiercely, stalled constantly and seized regularly. After testing the bike, I noted: "It's gray and black; so is a turkey." Brutally fast, the SC-500 was cursed with state-of-the-dark forks and a pair of chromed shocks that would have faded on a busy barroom door. It shook its steering head like a dog coming out of a swimming pool and the rear end hopped around like the frame had a hinge in the middle. All things considered, the only thing this bike did right was not leak around the gas cap. 6. 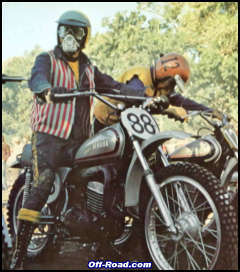 HARLEY-DAVIDSON BAJA 100. H-D brought this little stinker out to capture the small-bore trail bike market that was dominated by Hodaka at the time-the early '70s. They contracted with the Italian Aermacchi factory, which responded with a hopelessly tall, short-wheelbased, underpowered, ill-handling package that nearly defied belief. Still, H-D put together a desert racing team that started to dominate the trail bike class, so people went out and bought the Bajas in droves, only to find out they weren't buying what was being raced. The race bikes had everything changed! The stock bikes came with rigid footpegs, no horsepower to speak of, a huge overlay sprocket on the rear wheel that constantly came loose, a tank shaped like a mailbox, a saddle that felt like plywood and a strange metal hook strategically placed to rip your crotch off if you crashed. It also had stupid bars, dumb fat grips from a street bike and a suspension that had more side-to-side travel than up-and-down stroke. I called it "a re-hashed Italian street bike with no redeeming traits." Yes, we promptly lost the H-D ads at the magazine. 5. CZ 250 ENDURO. It was hard to believe that CZ would foist a pile like this mid-'70s bummer off on the public, but they did. Seeing a chance to get a piece of the enduro market, they simply took a late '60s frame, a dated engine, electrics that would have trouble lighting-off an .049" model airplane engine and suspension components that did little more than hold up the bike. It had rigid footpegs, a huge, bulbous tank, an exhaust that burned the leg, a speedo that didn't work and various bits and pieces that were attached with pure afterthought technology. The first time I fired up our test bike, the horn fell off on the ground. After I rode the bike 100 yards, the battery fell out and the wiring loom melted. In the next 20 minutes, the plug cap came off, the air filter fell off, the muffler cracked and wedged into the rear wheel, the gas cap leaked, both fuel lines cracked, a tire went flat and the throttle stuck wide open. The feeble engine was also horribly over-geared, the kickstarter would stick on the frame, fork seals weeped like a garden hose and the motor mounts fell out. This mount signaled the beginning of the end for CZ sales in the United States, and rightfully so. 4. YAMAHA YZ490 (MOST YEARS). 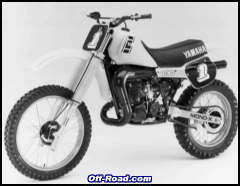 Yamaha introduced the YZ 490 in 1982, after a solid run with the YZ465. Sadly, the 490 was heavier than the 465, nowhere near as reliable, horribly difficult to start (hot or cold), came with a grim suspension, vibrated enough to bring blisters to your hands and was impossible to jet. If you jetted it rich enough to keep this dog from seizing, it would blubber, puke, foul plugs and produce no power. If you jetted it to run strong, it would invariably seize. It came with air leaks, a wandering ignition, gimpy motor mounts and the worst case of Yamahop at high speeds since the original DT-1. Yamaha issued a mountain of service bulletins to try to fix the problems. None of them worked. 3. PENTON 125 MUD LARK. 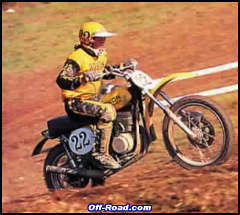 In 1973, John Penton was selling some great race and enduro bikes that were being produced by KTM in Austria. However, he was forced to buy a whole load of the Sachs 125B engines in order to get a supply of the "good" engines. So, to get rid of the B engines, John contracted with Wassel, an English fabricator, and they threw together a frame, a set of wretched Betor forks, ginky shocks and a layout that made you feel like you were sitting on the edge of a pinball machine. 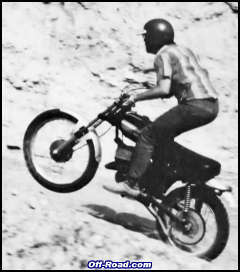 John called it the Penton Trials, but not even Batman could have ridden it in a trials event. There was no power at all, the gearbox was spaced oddly and it wouldn't turn without plowing the front end. So, in desperation, John renamed it the Mud Lark, a sort of all-purpose play machine. In fact, it was a no-purchase dirt bike, and will go down in history as one of the few bad business decisions ever made by savvy John Penton. 2. ANY THREE-WHEELER. Yup, the All- Terrain Cycle, or ATC, was introduced by Honda to let people who didn't have the skills to balance a regular two-wheeled bike ride in the dirt. Cute little buggers, the ATCs sold like crazy. Then savvy people started noticing that they handled like a shopping cart loaded with bowling balls with one locked front wheel going down a flight of stairs. 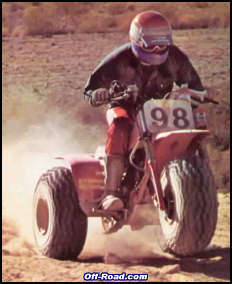 As the years passed, the ATVs got more and more powerful and they gave them forks and shocks. This let the unstable triangle wallow around, as well as defy the laws of physics when trying to turn. The rest is history. Three-wheelers are no longer being made. However, be warned! They're still out there, wiggling and lurching around the trails and sandpits of America. THE 1971 SUZUKI TM-400R CYCLONE! It weighed 242 pounds, dry, and delivered about 40 hp at 6850 rpm. Sometimes it delivered it at 4400 rpm. At other times, it would deliver it just when you least expected it. You see, the Cyclone had a weird ignition that would go from a starting mode to full advance whenever it felt like it. Even a change in temperature would change the power hit. Picture this: you're exiting a hard- packed turn in second gear and you roll the throttle on. All of a sudden, the engine lurches into the fat part of the power curve and the rear end leaps out about three feet. The chassis shudders and sends you sailing into the clear blue sky in a nice arc. Moments later, you thump into the ground, painfully, and then a microsecond after that, the Cyclone lands on top of you. Adding to the bizarre powerband was a set of forks that went rigid on square bumps and rear shocks that faded from anything hotter than headlight glare. Many companies produced endless handling and frame modification kits. None of these things seemed to help much, but the bike cost only $995 brand new and people kept buying them, trying to make them work. They all failed, to one degree or another, to tame the Cyclone. "For sale-1972 Suzuki TM-400. Only ten hours on bike. Possible injury forces sale. $500 or best offer."